Carly Fiorina has been active recently. The chairman of the Republican National Committee's Victory '08 is – as one lefty blogger says – “The CEO who drove Hewlett Packard into the ground? The CEO who alienated her own employees? The CEO the share-holders rode out on a rail? The same Carly Fiorina who's McSame's point woman on economic issues”. He likes the symbolism while others question her raison d’être. Slate: Democrats frequently need business surrogates and market whisperers: rich, successful people who can reassure the CEO class that the candidate won't threaten them much and that he understands the needs of business and the markets. Republicans traditionally haven't required such ambassadors, but McCain does. So Fiorina is dutifully making the rounds of the media circuit making the case that McCain has embraced the political correctness of the day and will use the administration to save the planet. Wired: But secondly to your very first question, unlike George Bush, McCain believes global warming is real. He believes climate change is real. He believes that the US must play a leadership role in addressing this problem. So when he thinks about energy independence, which is a national security issue, an economic security issue, he thinks about it in the context of also environmental protection, and making sure that we're making progress on global warming. Fiorina repeats McCain’s absolute belief in the need to fight global warming on CNBC this evening just a day after admitting in a Michigan campaign stop that there is still a possibility the whole global warming alarmism may be (glance right, glance left, whisper) ... not true. 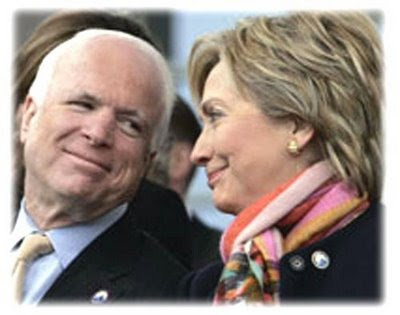 WWJ News radio: But the possible John McCain running mate certainly isn't Bushlike in her views on global warming, pointing out that if we fight global warming and it turns out not to be true, "all we will have done is create a bunch of new technologies and a bunch of new jobs," while if we do nothing and it is true, "that would be catastrophic." On one hand, it’s refreshing to know this is “say what you have to say” politics as usual. On the other hand, it’s the same old politics of justifying increased public sector spending regardless if there are any valid reasons. The lesson of American history is drive and thrive. If the Republican Party wants to win the hearts, minds and votes of the majority of American citizens, then they need to aggressively advocate for the ability to own and drive cars. Globe and Mail: After hundreds of angry drivers shut down highways in England yesterday in protest against green automobile taxes, and drivers and fishermen in France and Spain paralyzed their ports and roads in a fuel-tax protest, politicians began to signal Europe's ambitious emission-control policies may soon have to be abandoned. While Europe has led the way in using tax incentives to encourage people to buy low-emission cars and to build carbon-neutral houses in order to meet Kyoto targets, it has become increasingly apparent that inflation-battered voters are no longer willing to go along. Emotionally, there is no greater understanding of personal freedom than the ability to use time to go directly to where you want to go, when you want to go. One proper role of government is to insure the population is free to be productive. Computer programming can create fantasy but experimentally controlled empirical science explains reality. CO2 is harmless to ecosystems constructed from CO2. 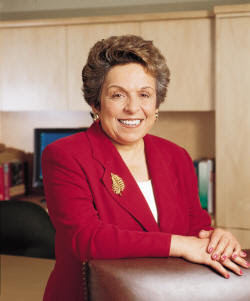 The news is on and I ask Lola: Does it look like the UW hired a Donna Shalala clone? She answers, I was thinking the exact same thing. I wonder if Biddy is picked because she neatly fits into Shalala’s old commencement robe. I refuse to speculate if she can fill Donna’s shoes. Those sort of legacy questions are best left until the actual hiring is confirmed. The brand new incoming University of Wisconsin -Madison Chancellor is quick to outline her vision for Wisconsin’s world class university. 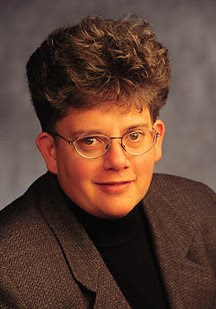 WKOW: "Domestic partner benefits have become increasingly important and it's the case that faculty do leave universities without them for universities that offer those benefits," says Martin. Well, at least she is coming for reasons other than filthy lucre. Capital Times: Martin, who reportedly made more than a half-million dollars in fiscal year 2006, will be taking a pay cut to come to Madison -- although she will make significantly more than Wiley's pay of $327,000 per year. In February, the UW Board of Regents voted to set a pay range of $370,000 to $452,000 for the position in an attempt to attract top candidates for the job. Lola and I decide we need a bit of a road trip having not escaped Madison since driving to Champaign to see James McMurtry in the bitter mid-winter cold. Searching for ideas, we discover Robert Earl Keen is playing The Pageant in St. Louis the Saturday night of Memorial Day Weekend, and the destination is settled. Since he doesn’t need to tour outside of Texas, it seems like a fair deal to meet him halfway when he does take the show on the road. Artist Direct: Among the large contingent of talented songwriters who emerged in Texas in the 1980s and 1990s, Robert Earl Keen struck an unusual balance between sensitive story-portraits ("Corpus Christi Bay") and raucous barroom fun ("That Buckin' Song"). These two song types in Keen's output were unified by a mordant sense of humor that strongly influenced the early practitioners of what would become known as alternative country music. The North Mississippi Allstars open with each band doing 75 minute sets. Lola and I settle into seats on the wing and chat with three couples from childhood friendships who similarly converge on this show from various parts of Missouri. I venture into the stage front crowd when the band plays “the road goes on forever and the party never ends”. Keen closes with Bob Dylan’s You Ain't Going Nowhere which is first recorded in 1968 by The Byrds on their seminal roots country album Sweetheart of the Rodeo. It’s a pleasant surprise and appropriate in that Sweetheart, arguably, is the recording that marks the abrupt about face from the excesses of psychedelia and back towards an appreciation of the music created by American working people. How can beer get cold if carbon dioxide traps heat? This is a good question to ask your celebrity cashier at Bratfest. Don’t, however, expect scientific answers from politicians or media employees. The Unholy Alliance that manufactured Global Warming: Please understand I am not claiming a conspiracy, but rather a cabal, which is defined as a secret political clique pushing a political agenda; in this case, designed by Maurice Strong. The unresolved question remains which local publication, The Isthmus or The Wisconsin State Journal will first have the courage to ask why cold beer is possible if carbon dioxide has incendiary super power? My bet is that Marc Eisen of the free weekly will ultimately be the first to admit in print that there are “legitimate doubts” about the ability of CO2 to magically induce ecosystem destroying infernos. I’m thinking his thinking will free up as he realizes that Kathleen Falk’s rising star has peaked. Maybe the epiphany will happen this Memorial Day Weekend. Cheers, fellow citizens! It seems to me that behind all the anti-capitalist rhetoric, what lurks is a knee-jerk aversion to accounting. The revolution thinks it's below its dignity to work through such grubby concerns as, y'know, whether its economic initiatives cost more than their product is worth. "Capitalist values!" they'll scream. "The bourgeois fixation with profit!" Discipline undoubtedly gets in the way of a good time and there is probably a case to be made that non-profit systems inherently decay into inefficiency. I suppose a corollary is that undisciplined spending can still produce functional results for long periods of time. I suppose a house of cards is stable in stable surroundings. A few observations from gazing in the still waters for backchannel currents. Over at The Volokh Conspiracy Peter Spiro, a professional academic, muses that American citizenship should be available to anyone who wants to be an American since America is an idea that people worldwide believe in. The lucid thoughts are in the comment thread. Earlier this month, Russ Feingold introduces the Senate version of legislation mandating Election Day voter registration for all Federal elections. Mandatory, of course, means no diversity allowed. The Election Day Registration Act: Senators Russ Feingold (D-WI) and Amy Klobuchar (D-MN) and Representative Keith Ellison (D-MN) are introducing legislation to help more Americans register to vote by allowing Election Day registration at polling places for all federal elections. As citizens, we must continue to learn. The United States is now more of a modern way of life, than some structural remnant left over from antiquated authoritarian obsessions with geographical hegemony. The pursuit of true democracy creates a moral imperative to gather up all the people and record a vote for every warm body. “All of a sudden it isn't morning in America, it's dusk on planet Earth”. Oh pleeezzz! Do you know how retarded this sounds to people with eyes and ears? Desperation, from the Latin desperationem, a noun of action from desperare "lose hope", seems to apply to the current position of the environmentalist alarmists. From The Nation, the most recent outburst from NASA paid employee, Jim Hansen. Earth at 350: A few weeks ago, our foremost climatologist, NASA's Jim Hansen, submitted a paper to Science magazine with several co-authors. The abstract attached to it argued--and I have never read stronger language in a scientific paper--"if humanity wishes to preserve a planet similar to that on which civilization developed and to which life on earth is adapted, paleoclimate evidence and ongoing climate change suggest that CO2 will need to be reduced from its current 385 ppm to at most 350 ppm." Hansen cites six irreversible tipping points--massive sea level rise and huge changes in rainfall patterns, among them--that we'll pass if we don't get back down to 350 soon; and the first of them, judging by last summer's insane melt of Arctic ice, may already be behind us. Restated: Thirty Five PARTS PER MILLION makes the difference between the planet of life we know and some unexplained but somehow horrible future planet of “irreversible tipping points”. This sounds like the opening offer for the regulatory set points at which the government steps in to command our economy. This also sounds like the negotiating position of those knowing for a fact that experimentally verified scientific truth negates their claims. Carbon dioxide emissions are harmless. Hopefully, the free market side of government demands proof the projections are accurate. My primary question is which local media source has the courage to publish the truth about the innocence of CO2. After all, The Isthmus and The Wisconsin State Journal both have access to the combined resources of the world wide internet in addition to the UW Madison Departments of Physics and Chemistry. I keep wondering which one will be the first to have the courage to tell the truth. The capitalists view the world as one economy subdivided into regulatory subdivisions. The socialists view the world as one population subdivided into regulatory subdivisions. When I find myself asking why none of our Presidential candidates are talking only in terms about what is good for the citizens of the United States, I force myself back to this truth about the reality of our moment. A Mourning Warbler appears in the yard this early evening following the seasonal warming back towards summer homes in the northern woods. This one may settle in the Rice Lake area now that habit has grown back from the extensive logging of a century or so ago. I’ve observed two Common Yellow Throats as the warblers continue to migrate. A White Breasted Nuthatch joins the groups of Purple Finches and White Crowned Sparrows feeding in the grass and trees then moving elsewhere. In the subsequent stillness I notice a large bird, probably a Marsh Hawk, perched on a low branch. She rests for several minutes then skims off low to the ground heading north. West Virginia Democrats know a bit about the practical purpose of unions. The point of organization is to secure fair wages and abolish unfair management practices. They appear to believe that unionism is both collective and local and they vote as if politics is about “Just Us”. Today, the pragmatic Clinton wing of the Democratic Party secures a two to one victory over the global “Justice” of the Obama theorists. West Virginia's Mine Wars: In response to poor conditions and low wages in the late 1800s, workers in most industries developed unions. Strikes generally focused on a specific problem, lasted short periods of time, and were confined to small areas. During the 1870s and 1880s, there were several attempts to combine local coal mining unions into a national organization. After several unsuccessful efforts, the United Mine Workers of America (UMWA) was formed in Columbus, Ohio, in 1890. In its first ten years, the UMWA successfully organized miners in Pennsylvania, Ohio, Indiana, and Illinois. Attempts to organize West Virginia failed in 1892, 1894, 1895, and 1897. In 1902, the UMWA finally achieved some recognition in the Kanawha-New River Coalfield, its first success in West Virginia. … By 1912, the union had lost control of much of the Kanawha-New River Coalfield. That year, UMWA miners on Paint Creek in Kanawha County demanded wages equal to those of other area mines. The operators rejected the wage increase and miners walked off the job on April 18, beginning one of the most violent strikes in the nation's history. By 1912, however, the Model T Ford with its gasoline powered engine has already started a liberation of the working class from local employment captivity. If you don’t have to walk to work, if you don’t have to be delivered en masse to work, if you can go work where you please, then you can optimize your life in America. Individual freedom is the tap root of American exceptionalism and it is a shame watching it being destroyed. Sigh. ... We are governed by fools and idiots. Governor Doyle Signs Climate Change Agreement with United Kingdom: Since coming into office, Governor Doyle has worked to make Wisconsin and the Midwest a leader in renewable energy. Last year, as Chairman of the Midwestern Governors Association, Governor Doyle spearheaded a regional strategy to achieve energy security and reduce greenhouse gas emissions that cause global warming that culminated with 10 Governors signing the Midwestern Regional Greenhouse Gas Reduction Accord. The Agreement: (in part) Wisconsin commits to joining the International Carbon Action Partnership and to working with the UK and others in sharing best practice on carbon markets and compatibility of design to facilitate the development of a global carbon market. We will aim to increase climate-friendly commerce between the United Kingdom and Wisconsin to bolster our respective economic positions while mutually benefiting each partner. It almost sounds like free market capitalism – “global carbon market” and “climate-friendly commerce” – but it’s not. When Governor Doyle and some hereditary British Aristocrat appoint the panel authorized to designate climate friendly commerce, I hope they set a quota for representatives of Mother Nature. I recommend seating Owls. Owls are wise. I hope they avoid credentialing Cows. Cows are stupid. Andrew Stern’s Service Employees International Union supports Barack Hussein Obama and Forbes announces SEIU Local 1199 President Dave Regan from Ohio is the Democratic Party superdelegate that should tip the nomination to Obama. As a superdelegate, the fact Clinton won Ohio is a non-factor. Obama is now open to the wishes of Andy Stern as he attempts to revitalize private sector unionism internationally. In the summer of 2005, Stern takes his union and leaves what he perceives as the stagnation of the AFL-CIO. Since then, his efforts to rebuild unionism have been controversial in the labor community, in large part because of his willingness to partner with business management. Where Andy Stern is taking the SEIU: Stern has not been shy about this focus on corporate partnerships. On Jan. 22, 2007 he told the Wall Street Journal, "We want to find a 21st century model that is less focused on individual grievances, more focused on industry needs." In 2006, he told the McKinsey Quarterly, "Employers live in a competitive environment and have to meet certain shareholder expectations, and labor can play a role in helping to meet them." The basis of his thinking is that private sector union membership is so low, that building membership is more important than membership benefits or membership input into decisions. Needless to say, this prioritization has some members upset to the point of open rebellion, in specific, California based United Healthcare Workers (UHW). Roots of the crisis in the SEIU: The SEIU International contends that the low numbers justify an organize-at-any-cost method that surrenders many members' rights. This method of organizing, which offers concessions and support of pro-business legislation for the employer's blessing to organize, is being challenged by Sal Rosselli, president of the union's second largest local. Since the Obama arm of the progressive movement is driven by theory, UMass Sociologist Dan Clawson jumps into the conflict to explain the theory behind the actions. Labor Wars: Any time an individual or organization gets held up as a model of success it invites others to launch criticisms, and that's certainly been the case for SEIU, which may simultaneously be the most admired and the most criticized of all unions today. Those criticisms focus above all on SEIU's top-down staff-driven model, and the consequent lack of democracy, combined with the argument that this sometimes leads SEIU to collaborate with employers. If our purpose is to build long-term power, one central issue is union density. If 95 percent of an industry is non-union, the 5 percent that is union is very limited in what it can win, because any agreement that involves substantial extra costs to the employer may force the employer into bankruptcy. … On the other hand, if the industry is 95 percent unionized, employers have less worry that a union gain will put them at a competitive disadvantage…. Given this, it might sometimes be sensible for a union to accept a not-very-good contract in order to increase union density, as part of a long-run strategy to raise density in an area, knowing that the greatest gains would come only with high density. The charge is that in effect, Andy Stern has cut a deal with the employer not to insist on substantial pay raises, in exchange for the right to sign up new members. SEIU nationally responds that UHW is willing to put the interests of current workers ahead of the unorganized, that UHW would cut a deal with the employer for a current pay increase and in exchange accept conditions that made it harder to bring in the unorganized. This, SEIU nationally says, is "just us" unionism (instead of justice unionism), making unions into a narrow interest group concerned about the interests of the small number of people currently in unions, instead of the interests of all workers, including those not yet in a union. Clever phrasing: “Just Us” unionism vs. “Justice” unionism. The socialism in one state model is perfectly willing to live with the job security of the former, but the theoretical worldwide solution to the woes of labor call for justice, even if justice takes times to reach critical mass. The difference is going to be a very narrow tightrope for Obama to walk. Workers of the World Unite! One of Barack Hussein Obama’s core supporters is Jimmy Carter’s former National Security Advisor Zbigniew Brzezinski. It is, therefore, instructive to pay attention to the world view Brzezinski outlines. The reasoning follows from the principle that socialism needs to be international. It requires a “workers of the world unite” foundation. It is telling that the story begins with reflections on sovereignty. Zbigniew Brzezinski: America today is the world's most sovereign state. To be sure, in our time the concept of sovereignty has been largely drained of content by the reality of increasing interdependence among states. For most states, sovereignty now verges on being a legal fiction. After all, even the undeniable reality of America as the sovereign power of last resort still begs the question: Sovereignty for what? Doubtless many would answer: for the sake of America's national security. But that reply begs a deeper question: Might not efforts to perpetuate America's unique status as an unconstrained sovereign eventually come to threaten America's national security, and its civil liberty as well? It will require increasingly supranational cooperation, actively promoted by the United States, to compensate for the weakness of nominally sovereign states that in fact are becoming ever less sovereign or even self-sustaining. The nation-state framework has become too narrow for the political solutions, economic remedies and social "depressurization" that a majority of populations urgently need. The historic paradox of our time is that supranational cooperation toward these major goals is only possible if the lead is taken by the last sovereign state, and joined by the more resilient regional powers willing eventually to subsume their own sovereignty under more effective supranational arrangements. The most concise way to summarize all of this is that America needs to change to adapt to the world, rather than the world adapting to become more like America. It is the view of people who believe American exceptionalism depends on injustice and should not be emulated. When I term the Obama wing of the Democratic Party Theorists, is it precisely because they believe the “nation-state framework has become too narrow for the political solutions, economic remedies and social "depressurization" that a majority of populations urgently need”. They see an international set of problems requiring international solutions delivered by international organizations with supranational jurisdiction. It is insane to keep electing the same people and expecting different results. Observing the tensions within the Democratic Party, it strikes me the fault line is forming between the academic Marxists who understand that socialist theory is and must be international, and the pragmatic socialists who believe that “socialism in one country” is an important and desirable goal. Barack Hussein Obama is the figurehead of the Marxist academics and their youthful dupes. He has been cleverly selected to attract a large established American voting bloc. Remember, the struggle of the working class in all countries forms the basis for the movement towards Socialism. The needs of the people are not constrained by political boundaries. The Clintons are the more pragmatic intellectual heirs to the “socialism in one country” theory of Nikolai Bukharin. It is this concept of a national socialism that Joseph Stalin wholeheartedly adopts, and which justifies all the Nanny Statism smothering Europe and growing in America. It is the reasoning that the removal of capitalistic inequalities will not occur in one fell revolutionary swoop, but rather piece by piece as governments are converted. Converting the single most powerful government on Earth, however, is the change with potential to bring the rest of the First World economies into doctrinaire compliance. Those who believe the role of government is to use power in the best interest of the working population understand the coming Federal election is the best opportunity in decades to make real changes. Both sides of the Democratic Party covet this moment and history is fairly clear that competing socialists really hate each other. If I ran a community newspaper, I would reprint Stephen Wilde's article in it's entirety on the front page. I would then take credit for breaking the “news” followed by trumpeting a commitment to bringing the truth to the public while also advocating good stewardship of the environment. Global Warming and Cooling - The Reality: The greenhouse effect, as a whole, may smooth out rises and falls in temperature from other causes but is not itself the determining factor for global temperature. If the heat from the sun declines the global temperature will fall with or without any greenhouse effect and if the heat from the sun increases the global temperature will, of course, rise. The greenhouse effect does not create new heat. All it does is increase the residence time of heat in the atmosphere. It seems so complex but the global heat balance only comes down to three parameters that swamp all others. Heat from the sun. The fact that 70% of the planet is water covered. Heat, radiating out to a very cold Space. The planet cannot maintain and does not maintain a constant temperature. It is not even possible to identify a specific current temperature for the whole planet and for present purposes there is no need to do so. All I need to assert at this point is that whatever the Earth’s temperature is at any given moment it will always be in the process of warming or cooling and, of course, the rate of that warming or cooling is highly variable. In any event, since cooling is worse than warming for humanity and most life on the planet, our production of CO2, however large in our puny terms, would be wholly beneficial for life on Earth. CO2 is the least of our problems so our attention and resources should be better directed to a more general concept of sustainability. This Madison evening, Swainson's and Veery Thrushes show up in the yard, as do Rose Breasted Grosbeaks and a Red Bellied Woodpecker. The coal fired power plants at the heart of FDR’s Rural Electrification Program have failed to extinct these species and there is no physical evidence that carbon dioxide has planetary destructive powers. Public policy can serve both mankind and the natural world. It will best serve both by examining and rejecting false theories, deliberate exaggeration and manipulative lies. Anyone doubt there is sophisticated propaganda campaign in the media? Google News me this Batman: Results 1 - 10 of about 27,743 in the last hour for global-warming. How fossil fuels killed the dinosaurs: … the asteroid hit oil or coal deposits when its impact made the 200km-wide Chicxulub Crater, just west of Mexico's Yucatan Peninsula. It struck with such force that the buried carbon liquefied, rocketed skyward, and formed tiny airborne beads that blanketed the planet in soot. Researchers have previously suggested there were mass extinctions as global forest fires pumped enough carbon dioxide into the atmosphere to cause a period of runaway global warming, or they spewed enough soot to block out the sun and kill off the plants on which herbivorous dinosaurs fed, starving the meat-eaters further up the food chain. Well aerosol particulate COOLING is well understood from documented volcanic explosions. Block the sunshine and things get cold and cold suppresses life. If the dinosaurs, however, were killed by “a period of runaway global warming” we know the mammals survived it. Hey, aren’t we mammals? Koalas threatened by climate change: "I'm sure we'll see koalas disappearing from their current range even though we don't see any change in tree species or structure of the forests." Prof Hume will present new research at a major science conference in Canberra today showing that increases in CO2 decrease levels of "good" nutrients and increase toxic nutrients in eucalypt leaves. Hummm… What exactly is a “toxic nutrient”? By the way, how did those ancestral koalas survive that effectively instantaneous combustion generated increase in CO2 referenced above? Maybe they were hyper-fast evolvers with Lamarckian superpowers. Planet may get too hot for tropical insects, warn scientists: Scientists say insects in the tropics are far more sensitive to temperature rises than those elsewhere. They predict it will be difficult for them to survive temperature rises of up to five degrees predicted by 2100. OK. Bugs are fragile. Step on one and see how easy it is to extinct it. Still I think bugs may survive nights a few (unspecified) degrees warmer that normal. I’m sure the science writer-journalist of this piece understands the greenhouse effect delays cooling, so the effect produces warmer night time temperatures rather than more daytime heat. The Sierra Club is using every legal and regulatory challenge available to stop any coal fired electricity plants from being built in the United States. They have a chart with all their projects: Stopping the Coal Rush, including “victories” in Wisconsin. Madison based Bruce Nilles explains everything being done is to prevent carbon dioxide from causing global warming. As evidence mounts that carbon dioxide has virtually no potential to adversely affect air temperature or ecosystem stability, it raises a question conservationists need to consider. How much good could be done if every penny the Sierra Club is spending on legal resistance to coal plants was spent instead on purchasing wildlife habit? The Sierra Club is not a conservationist organization. They are harming the movement. This may be the best thing Isthmus Executive Editor Marc Eisen has written. When policy trumps results: This earnest but unhelpful committee delved into the abstractions of what distinguishes "equity" from "equality," how the board might commit to equity and what esoteric guidelines could measure that commitment. If you are already slipping into catatonia from the meaningless rattle of words, that's understandable. This is stuff that appeals to progressive professors at the UW-Madison School of Education and to graduate students who aspire to become progressive professors at the UW-Madison School of Education. "Equity," the committee announced in its report to the board, "involves opportunity; access; elimination of barriers; distribution of resources; protection of specific groups; recognition and acceptance of differences" and marches on for another 75 words in an act of faux definition. The lack of discipline in Academic writing is shameful. We have institutions of higher education demanding a magnitude and frequency words on paper, to demonstrate and justify scholarly activity, yet there is no corresponding requirement these words concisely express thoughts and concepts in simple clear understandable terms. This is how gibberish thrives and now we have gibberish masquerading as reasoned public policy. I can't for the life of me see them rallying around a pompous and abstruse equity policy, especially one that reads like it was formulated by the UW Department of Leftwing Social Engineering. Marc Eisen is making the point that Madison is saturated with the thinking that creation of policy is the purpose of government, however, this is not counterbalanced by an insistence that real world results of public policy are the standard of final judgment. In the private sector, performance dictates policy which explains why the private sector works for the public more efficiently than government. Especially government, for example, where leadership holds firm to a belief that Inclusionary Zoning works because it works on paper. A Palm Warbler drifts through the back yard this afternoon. It is about a three minute stop but long enough to sight him up with the binoculars for a positive identification. That distinctive chestnut head plumage will be faded when it heads back southward at summers end. Two additional surprise sightings are an Indigo Bunting and a Rufus Sided Towhee. All day long the yard is filled with birds as the landscape finally frees itself from the prolonged life suppressing cold of winter. 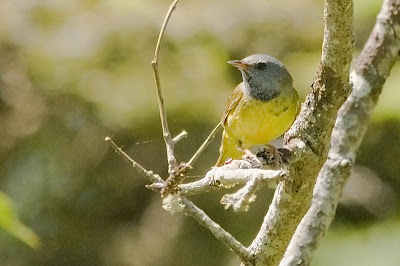 A House Wren hops up and down along a rock wall while an Acadian Flycatcher darts between newly budding tree branches. The Cardinals, Crows, Chickadees and Wild Turkeys make appearances, acting like they are natives to the area. A Blue Jay and Hairy Woodpecker show up late in the afternoon. White Throated Sparrows, with their yellow eye dots, kick up leaf litter as do a pair of Catbirds. Later on one of the Catbirds perches atop a sumac flower picking out the last tasty goodness leftover from last fall. I don’t understand why Mayor Dave Cieslewicz and his environmentalist comrades believe so fervently that people and nature need to be separated. 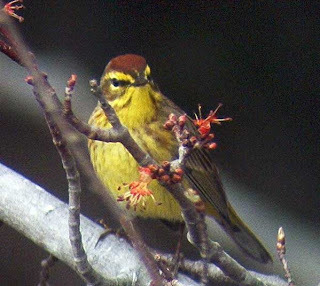 That Palm Warbler has no preconceived idea of what constitutes a natural ecosystem. It just goes where the bugs are plentiful and there are adequate trees for safety and shelter. Climate Skeptic: Observe today how little of the discussion is about anything other than climate. There are still many environmental issues in the world that can be improved by the application of man's effort and technology -- unfortunately, climate is the least of these but the issue getting the most attention. Consider how the global warming panic has sucked the oxygen out of the environmental movement. Ten years from now, I predict that true environmentalists will be looking back on the hysteria over trace amounts of CO2 in the atmosphere as a huge setback for real environmental progress. Maggie's Farm: As readers know, we are old-time Conservationists here. We believe in National Parks, State Parks, nature preserves, farmland protection, habitat protection, species protection, zoning, "open space", clean rivers and waters, unpolluted air, and we do not approve of the government subsidizing real estate developers and urban sprawl by building highways to nowhere. The Audubon Society came into being to protect Egrets. … At the turn of the century, those breeding-season plumes were all the rage for decorating lady's hats. Thus our egrets - the American and the Snowy in particular - were hunted almost to extinction. That is called "unsustainable use." The same applied to the market-gunning and netting of waterfowl - and the Passenger Pigeon. Of necessity, we now have hunting laws, hunting seasons, wildlife refuges, and protected species. Thus we are not Libertarian when it comes to land-use and unsustainable and irreversible exploitation of wildlife or wildlife habitat. The Conservation Movement of John Muir and Teddy Roosevelt had to become politicized, because laws were required in the presence of competing interests: witness, nowadays, the political conflicts in MA and in Europe around the efforts to enforce sustainable fish harvests. We simply try to be rational about it all.